Deeper Grace is the kind of book that can sweep through an entire congregation and bring new growth. It will re-awaken a desire to dive deeper again into the mystery of God's grace. Churches spend money on sound systems and coffee bars. Good sound and good coffee are great, but what the world is desperately seeking is a people full of grace. Deeper Grace helps you discover the source of all growth in Jesus, and the foundations of life with Christ. God’s grace is the wellspring of spiritual formation, but we have shortened “Grace” to mean only forgiveness. We need a greater grace. Deeper Grace reminds us again of the wealth of Heaven available to every student of Jesus. Ray Hollenbach, a Chicagoan, writes about faith and culture. He lives in central Kentucky, which is filled with faith and culture. After 15 years as in a pastoral role at the Vineyard Christian Fellowship in Campbellsville, Kentucky, he now travels and speaks on issues of personal spiritual growth and discipleship, and consults with church leaders on the path to church health. He blogs at StudentsofJesus.com. Start reading Deeper Grace on your Kindle in under a minute. The first two sentences summarize the dilemma of grace very well: "Too often we have shortened grace into a simple retelling of forgiveness, but it`s so much more. (…). Grace is the atmosphere of our life with God." To keep it short: I finished "Deeper Grace" about a month ago now and found it a real eye-opener. Grace has become visible, and I keep discovering traces of grace in my life, in my past and in others. The chapters about the various manifestations and aspects of grace are concise, yet never dry or too short to really engage the reader. They are both serious and witty in time, with plenty of food for thought. Quotations or retelling of scripture passages are interspersed with Steve Martin bon mots or personal observations. And there are little exercises as well, uncomplicated and gentle, to make things practical and let them sink in. What did it for me was reading about what grace is (and what isn`t!) from so many angles. Until, in a way, the "concept" of grace turned into something multidimensional, almost tangible and very much alive. A reviving book. I'm glad I read it and I highly recommend it. Just getting into Deeper Grace - wow, what a treasure. Ray Hollenbach has a true gift for taking fuzzy and abstract ideas that we have become numb to and making them come alive, relevant and practice. Going back for another ladle of grace on the plane. Page turner. That's not a description usually applied to a Christian growth book, however, that was my experience. I couldn't wait to get to the next thought or story. I used it as a devotional and we will study it in our small group this fall. Well written. Encouraging as well as challenging. I highly recommend it. Ray Hollenbach has taken the understanding of grace, not only to a deeper level, but to a place that the reader can make application to themselves. As one delves into Ray’s compendium of discovery, the concept becomes easier to understand and each reader will discover that God’s grace is not only available, but comes in great abundance—in many shapes and sizes. It takes a gifted writer to share extremely profound ideas in simple and humorous ways, but Ray Hollenbach excels at this. Deeper Grace has presented a grace that is not merely defined by forgiveness and eternal destination but by a divine empowerment that sustains each follower of Christ, not only daily, but with each breath. Each short chapter is a refreshing breath designed to help the reader experience and appreciate the grace that easily goes unnoticed and what's worse, is often taken for granted. Grace is so much more than forgiveness--it is the atmosphere that surrounds us all. I have found that Deeper Grace has helped me to not only see more areas of my life that need growth, but that grace is already there--already at work without my acknowledgement. I encourage any follower of Christ to take up this book. Read it slowly and reflect on what it has to say. Like grace itself, this book is not just meant to be read, it is meant to be absorbed. Grace not only covers sin; it saturates our lives. I have experienced what Ray writes but was never able to explain it. 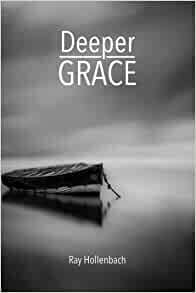 Deeper Grace is just the book I needed to help me express to others God's unsearchable grace. Written so beautifully! Ray paints grace in living color. Practical, helpful, biblically accurate. I loved reading it. This book is priceless!